In March the Butterflies come back and so today we are going out to look for them. 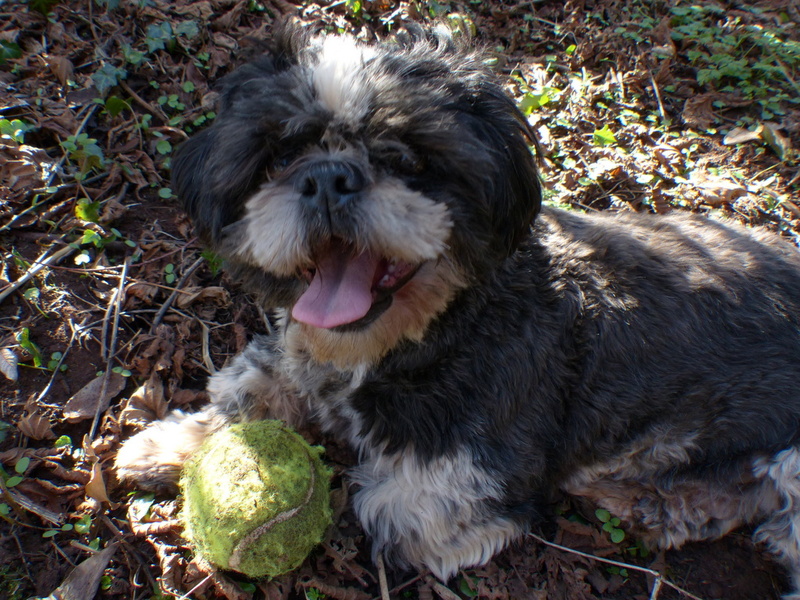 Fizz has got her happy face on. I haven’t seen that face for a long time. She is not really happy (well, she is always happy) she is hot and she is panting and it hasn’t been hot for a very long time. It didn’t take us long to find a Butterfly. 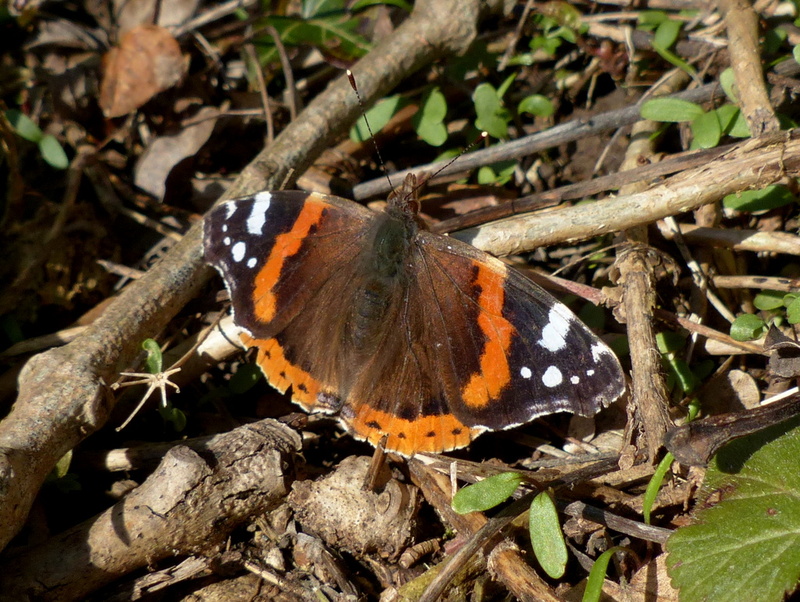 This is a Red Admiral. 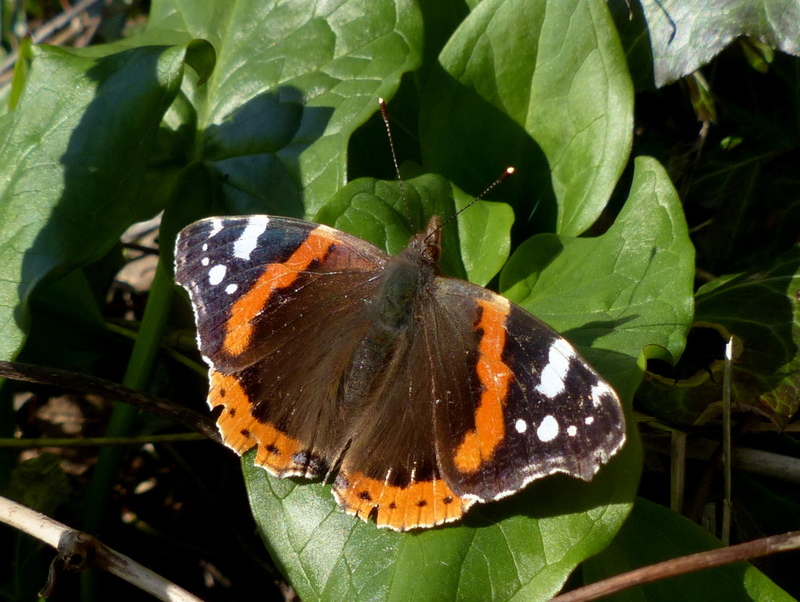 The Red Admiral is a migrant species that arrives here in the UK in May and June flying in from Europe and North Africa. It is only fairly recently that it has been considered a resident species, they don’t like our cold winters. Butterfly Conservation says on it’s website, “There is an indication that numbers have increased in recent years and that overwintering has occurred in the far south of England.” That needs updating. 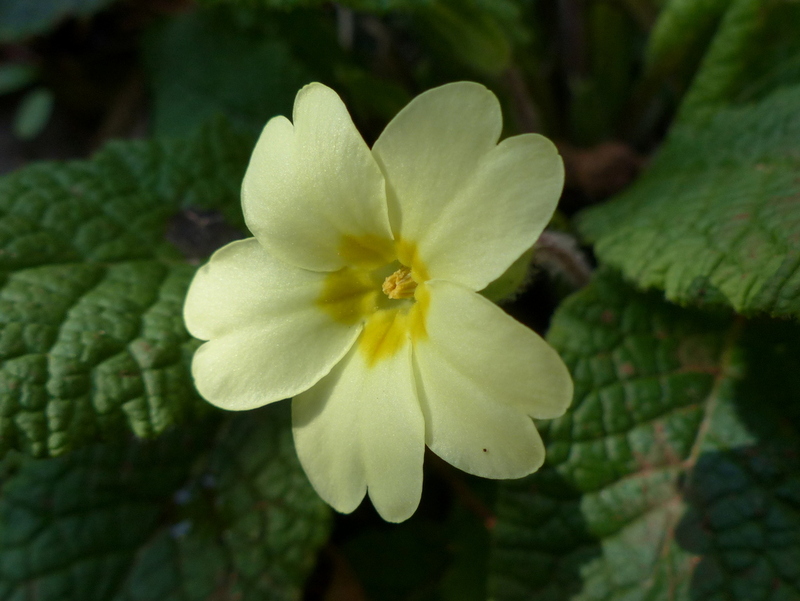 It does look a bit tatty but so would you if you had been outside all winter. We better find it some nectar plants. You can try some of these. 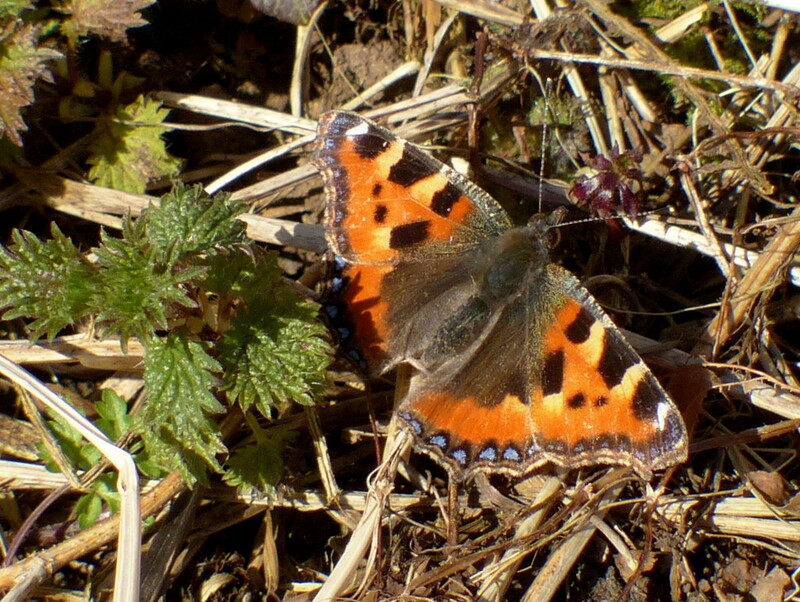 There is another one, a Small Tortoiseshell. Oh Joy. 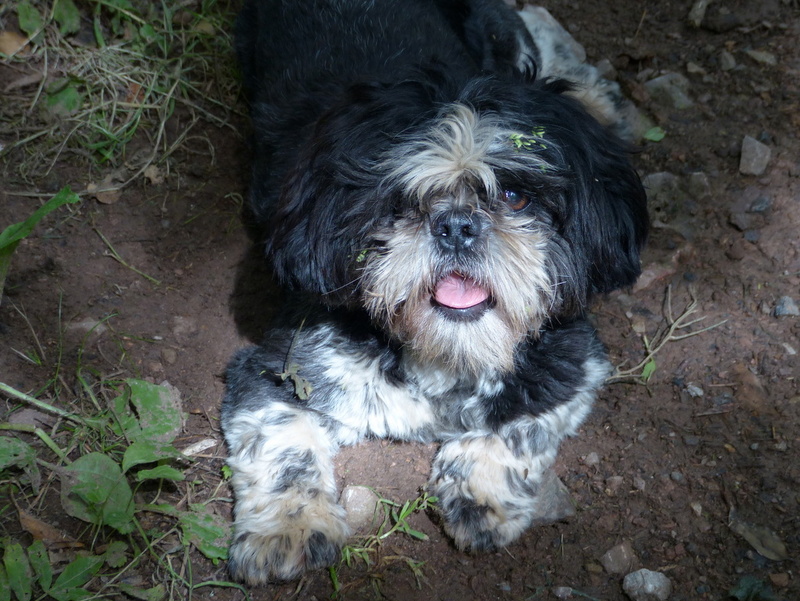 The flowers are flowering, the Butterflies are coming back and Fizz has got her happy face on. 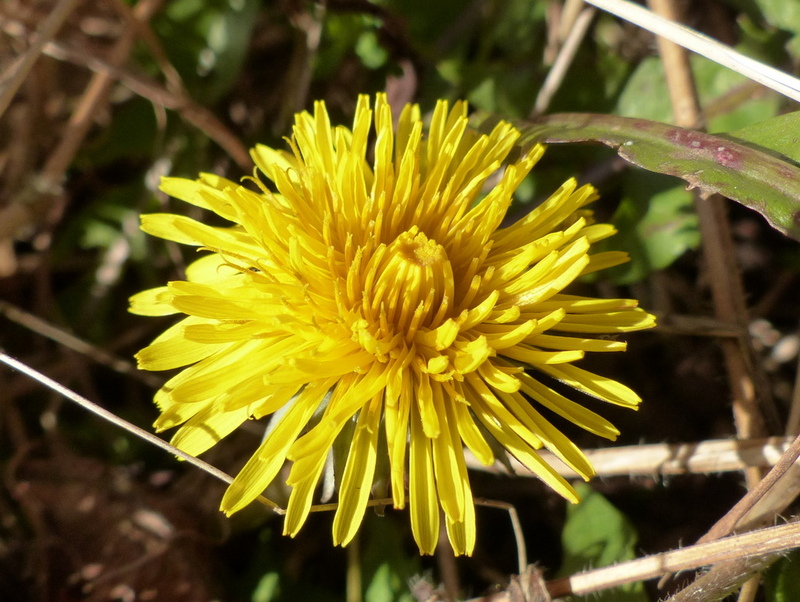 Coltsfoot Now Fizz and I are tired of all this sunshine and Butterflies and flowers. 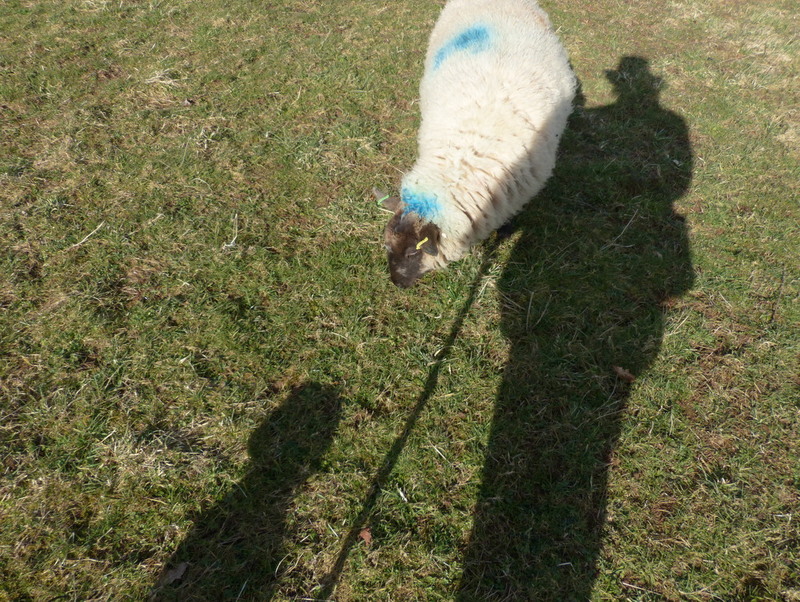 We are going up on the bank to get our photographs taken with the sheep. 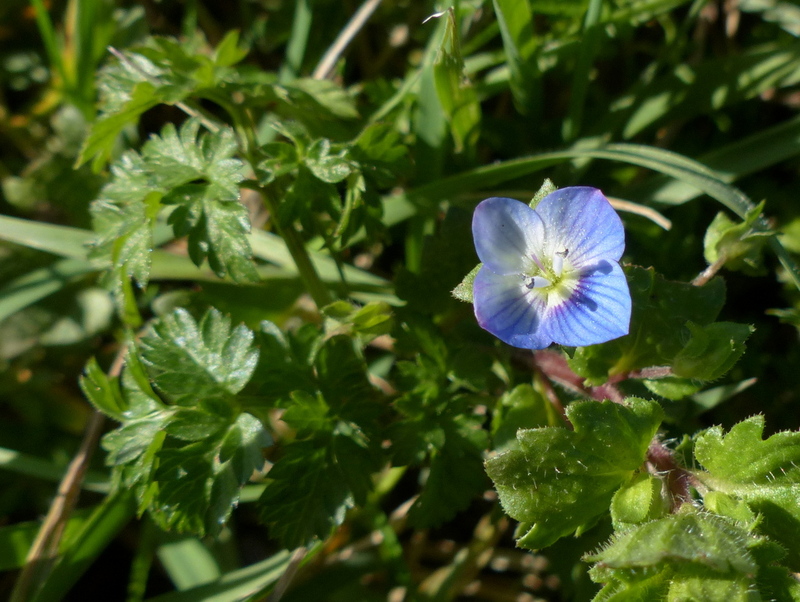 On the way we find another little flower that we haven’t seen yet this year. Okay, let’s make some selfies. Everybody crowd in. 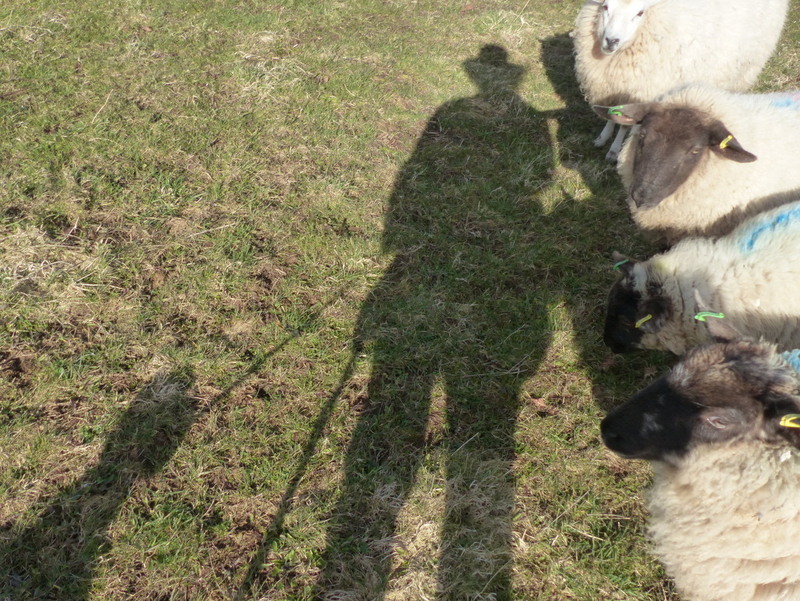 Our shadows are getting very short, mine used to be about ten sheep long. 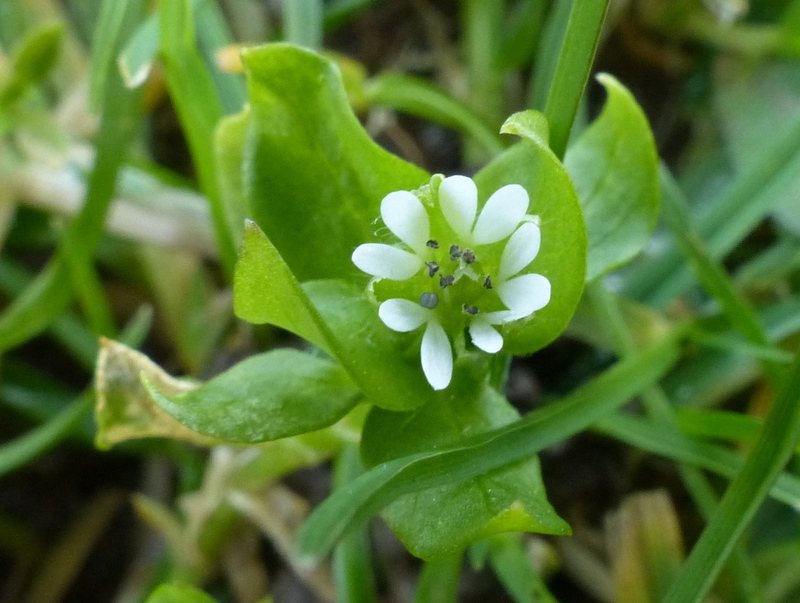 I have written about Stellaria media today but I have had to leave quite a lot of important stuff out because I just didn’t have the photographs. 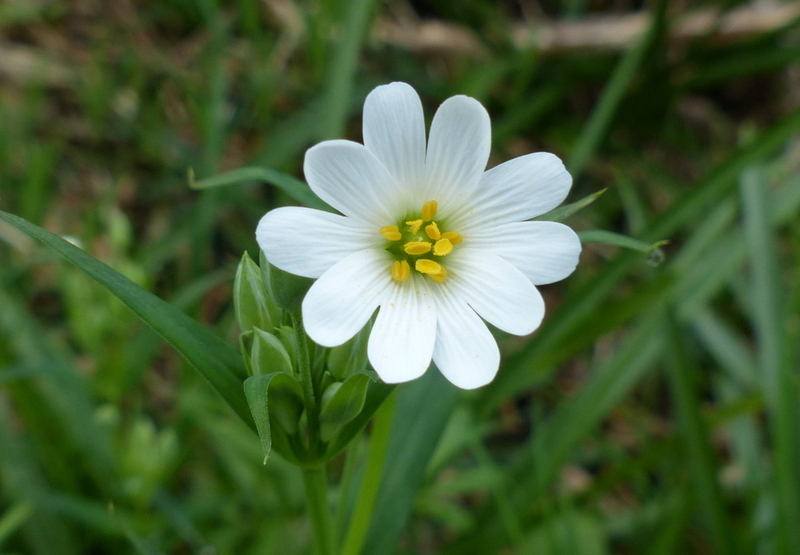 I haven’t seen it in flower yet but it won’t be long and then I shall get the pictures and update the post. 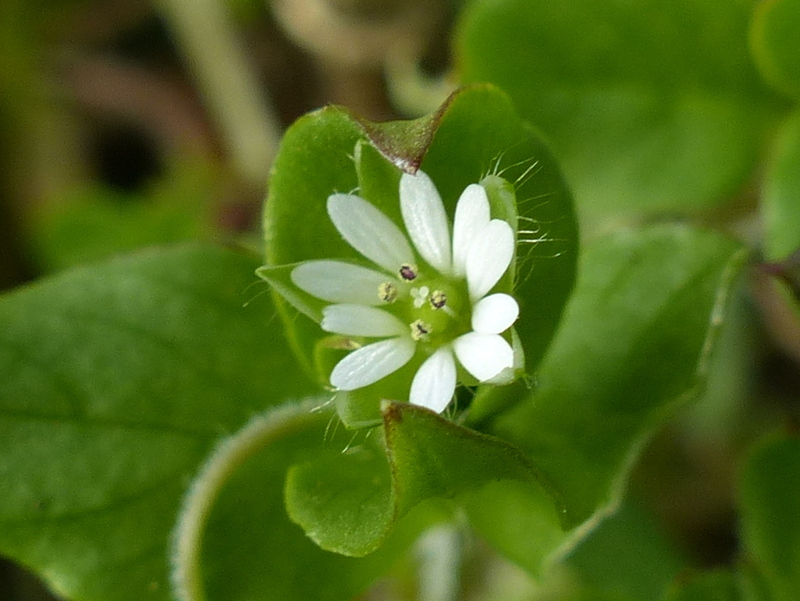 Common Chickweed is a member of the Stellaria genus of flowers. 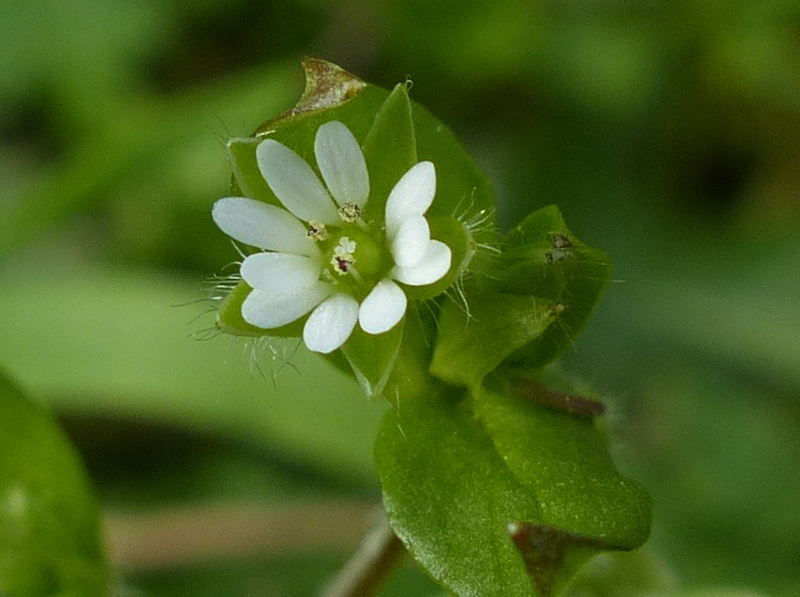 It is a very small flower, about a quarter of an inch in diameter (6-9 mm) and in common with other Stellaria species it has five white petals. 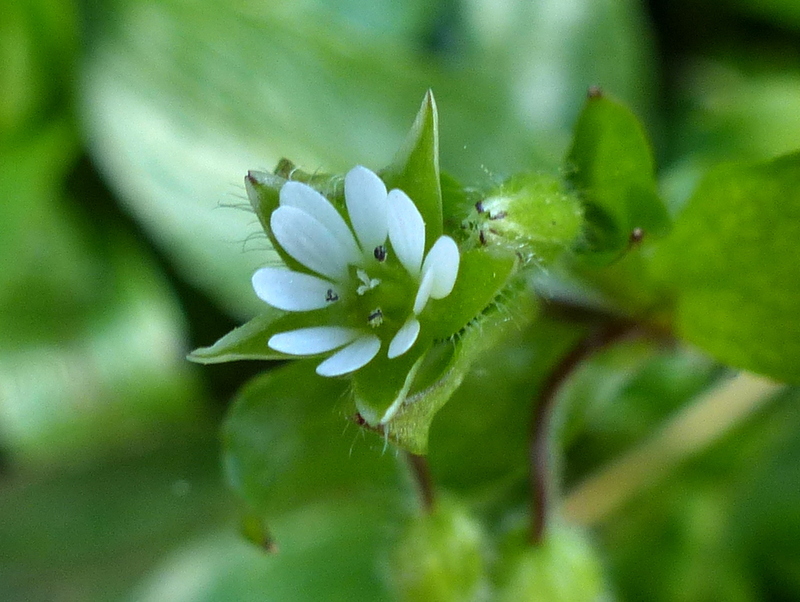 The five petals of Stellaria media are divided right down to the base, giving the flower the appearance of ten petals and note that the petals of Common Chickweed are shorter or no longer than the sepals and that the sepals are hairy. 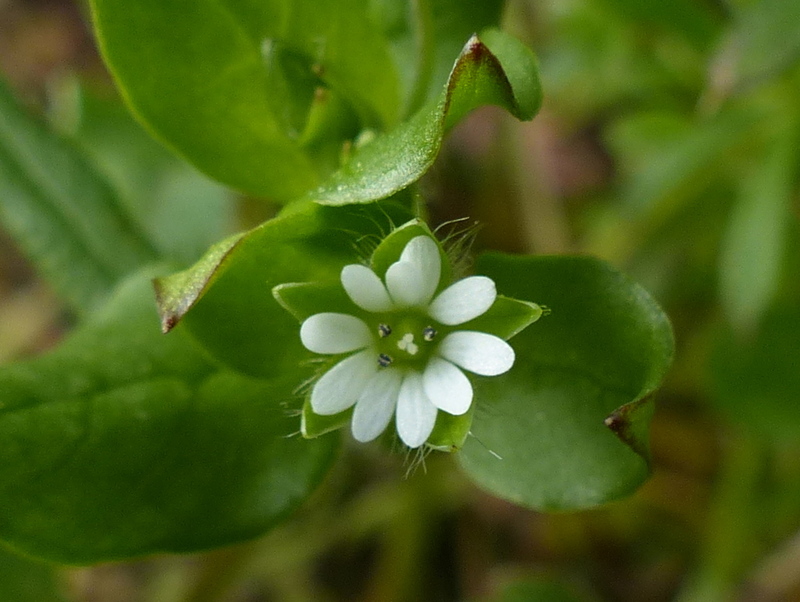 Compare Common Chickweed to two other Stellaria species that are commonly found here. 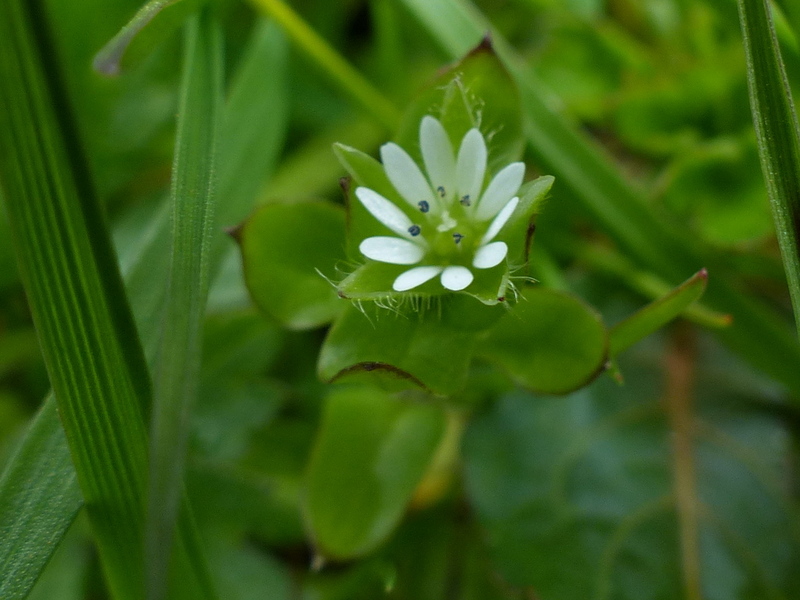 Common Chickweed has three styles that sit on a green ovary. 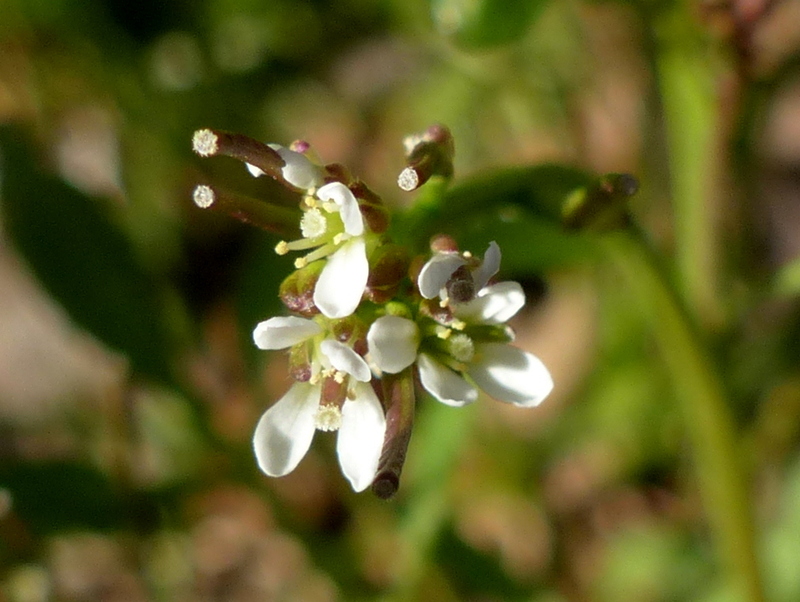 The number of stamens can vary from three to eight. 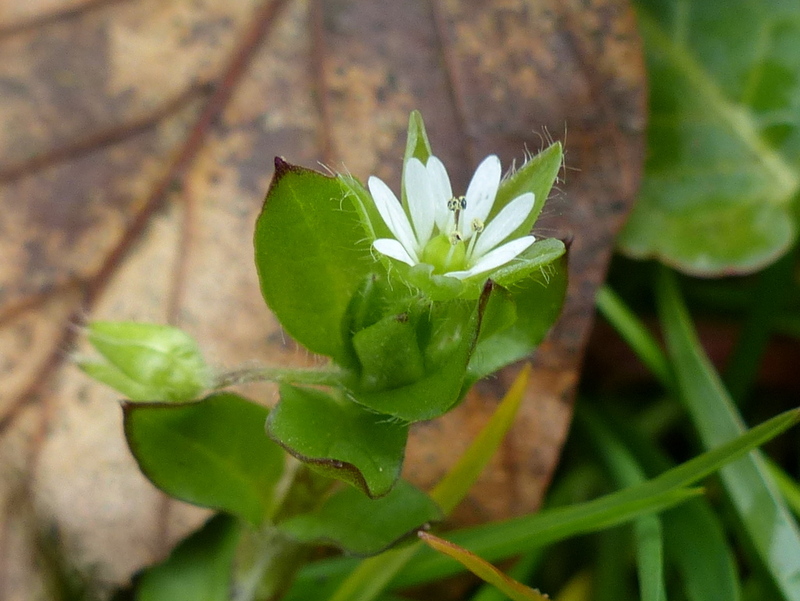 Common Chickweed has a weak stem, it will often trail along the ground but it seldom rises more that about eight inches. 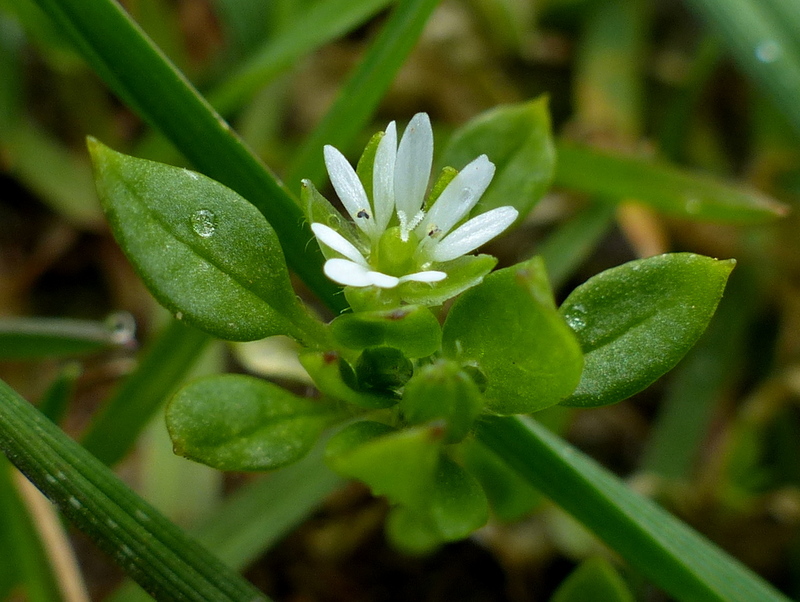 It is a small plant but if you find it growing in any quantity it is worth remembering that it is a tasty edible. 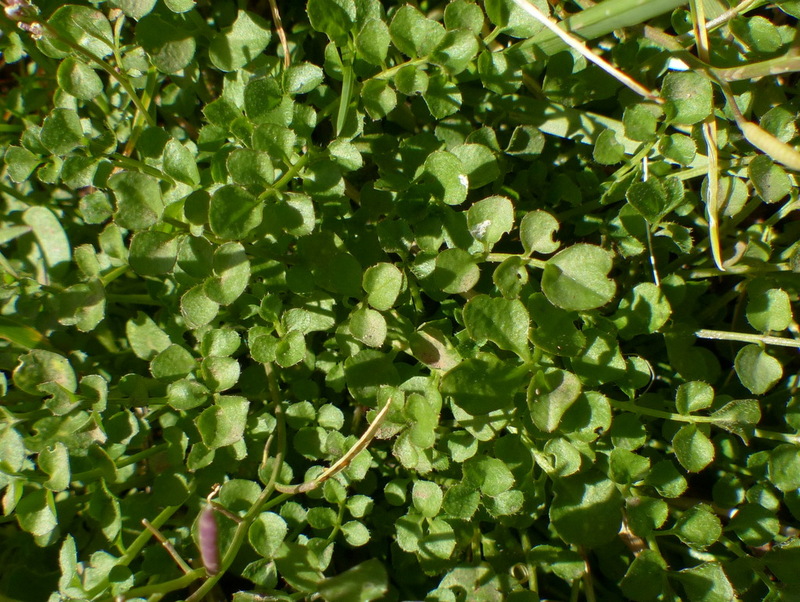 The leaves can be eaten raw in salads. 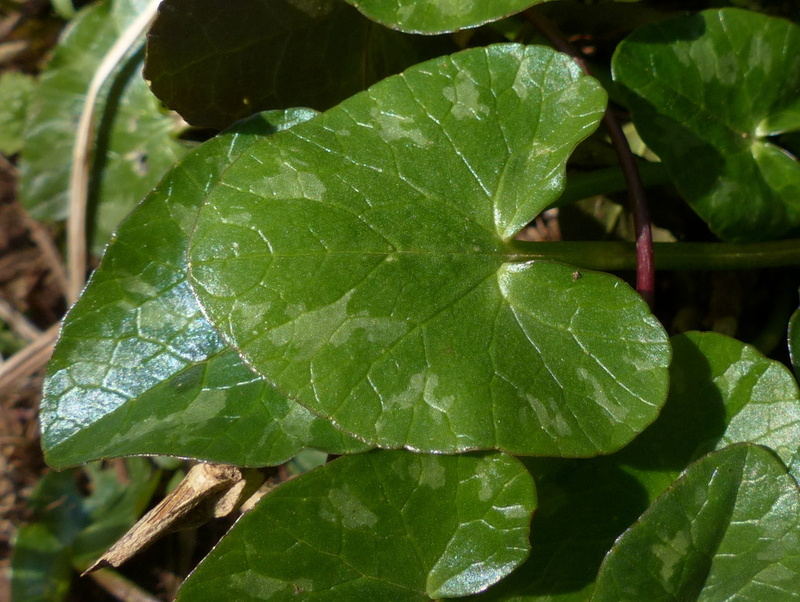 The leaves are oval and smooth edged with a point at the tip, they grow in opposite pairs along the stem. 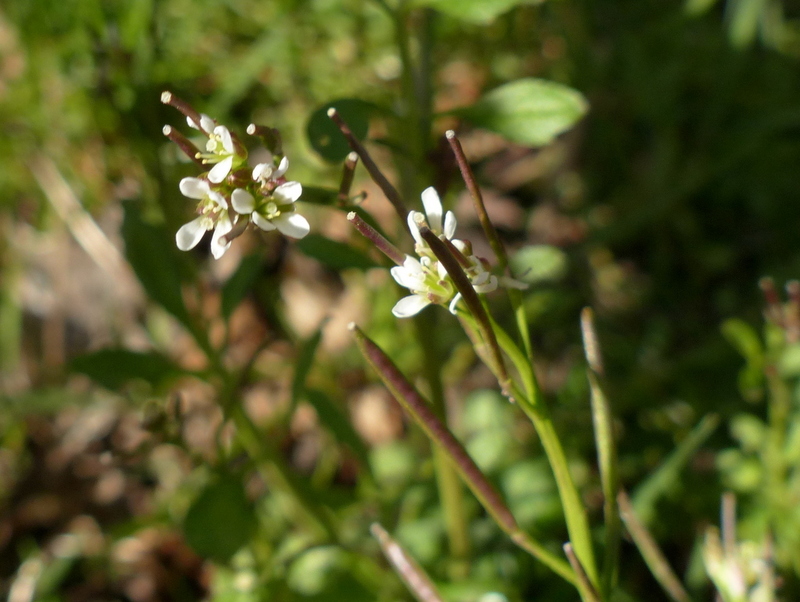 Leaves at the base of the plant have quite long stalks and toward the top they are stalkless. 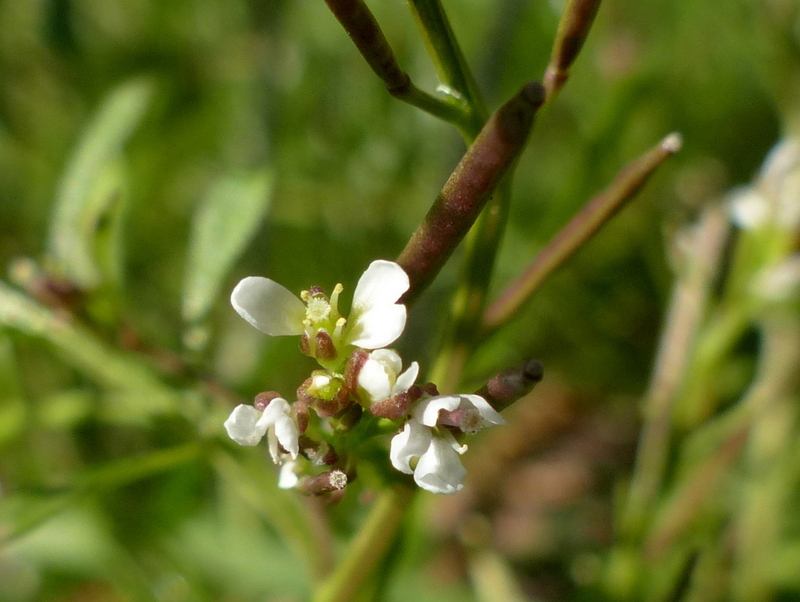 It is a valuable wildlife plant, a food plant to several moth species it is probably best known as being favoured by birds. Chickens eat both the plant and the seeds and that is how it gets it’s name, many small birds like finches eat the seeds and you can also feed it to cage birds. 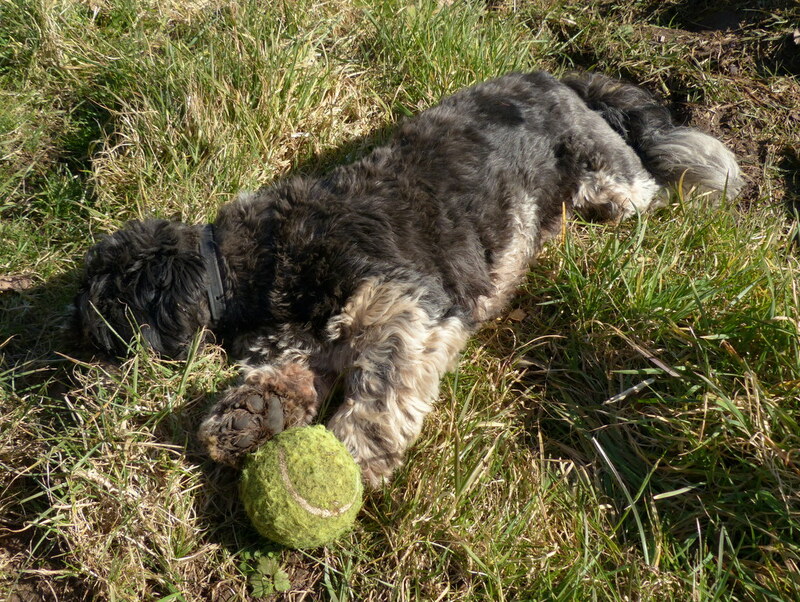 Good to see Fizz enjoying the warmth. Lulu says ‘hi’. She is on a farm for a while because mum and dad are travelling. I hope she hasn’t had any bad encounters with sheep. 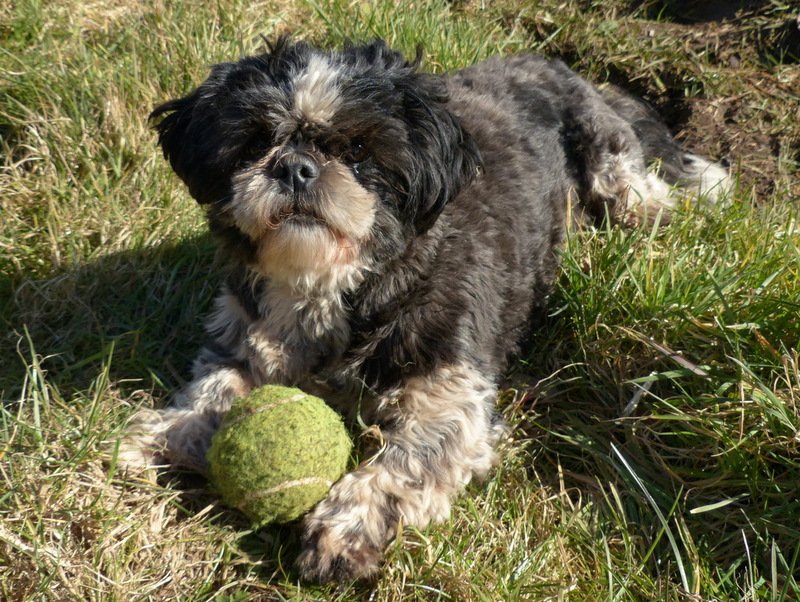 Lulu will have a permanent home from April 9th Colin. I think she is a bit confused but has adapted remarkably well all things considered. She will have a house full of builders to contend with then but at least she will sleep in the same place each day. Thank you Joey 🙂 Fizz does enjoy the sunshine, warm mud is so much better than the icy stuff. 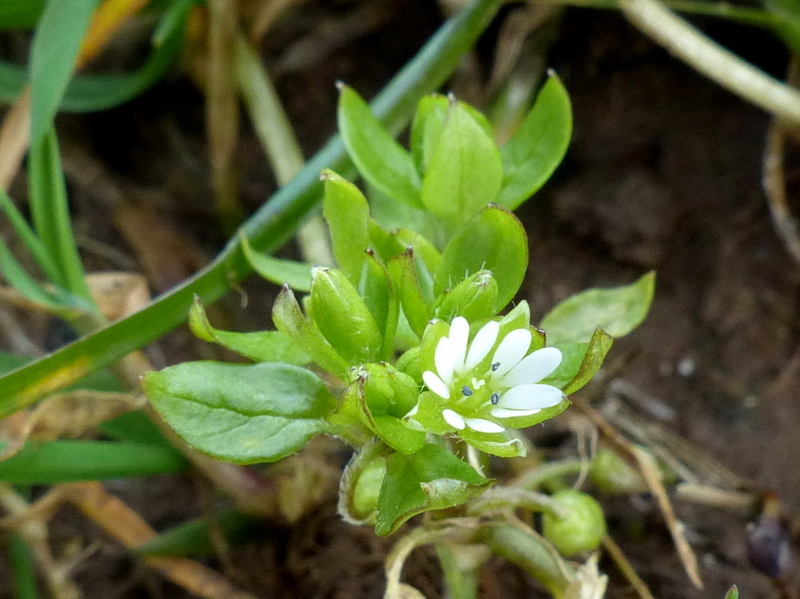 Thank you Clare 🙂 There are quite a few Stellaria species and I don’t think that I have seen them all.Your plant may have been Lesser Stitchwort (Stellaria graminea) it has quite conspicuous pinkish brown anthers. 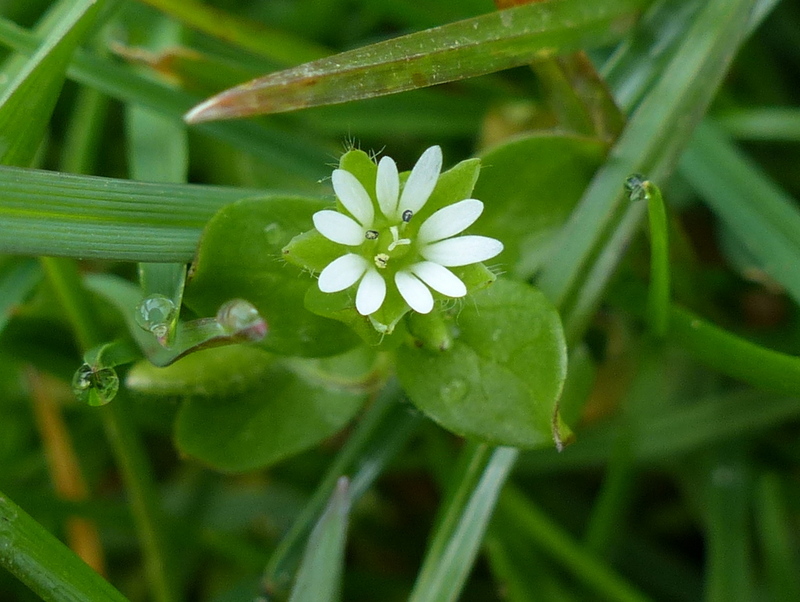 The first difference that I would see is that Common Chickweed is a tiny flower. 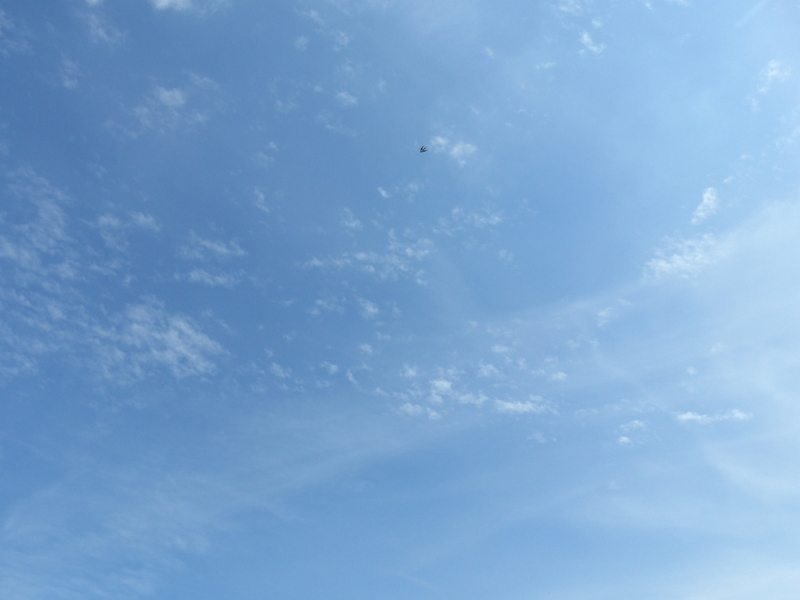 It is one of those that I have to bend down to see what that little white speck is. The leaves are very different. 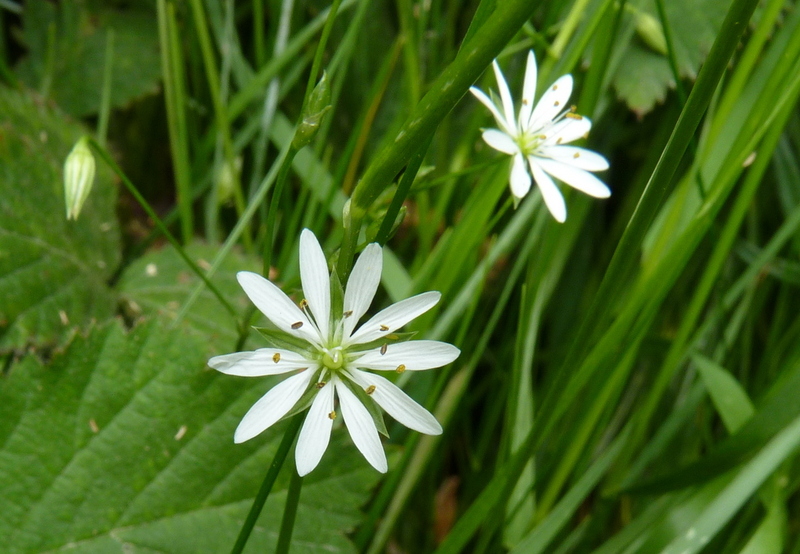 Another name for Lesser Stitchwort is Grass-leaved Stitchwort and the leaves are very long and thin. 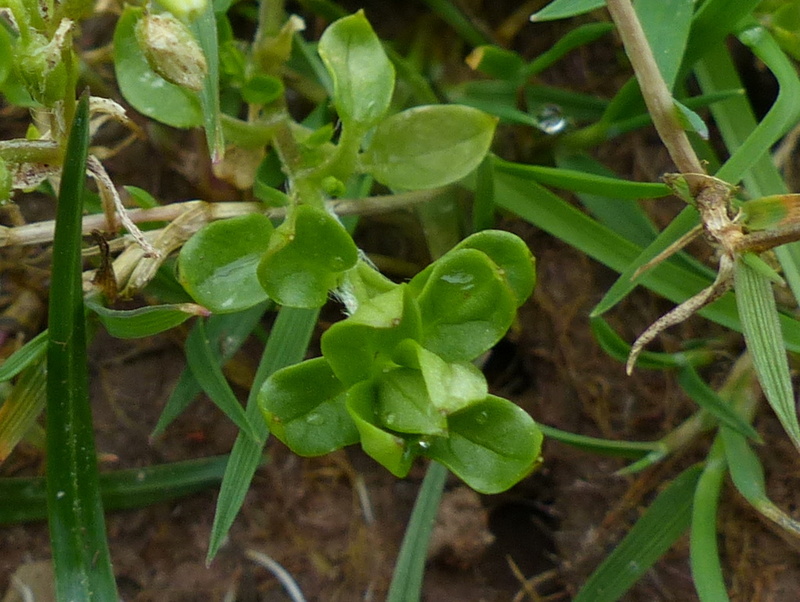 In Common Chickweed they are almost egg shaped. I enjoy seeing your beautiful butterflies and it makes me hope ours will be here sooner rather than later. Fizz, she is always happy, isn’t she? What a joy that little dog is. 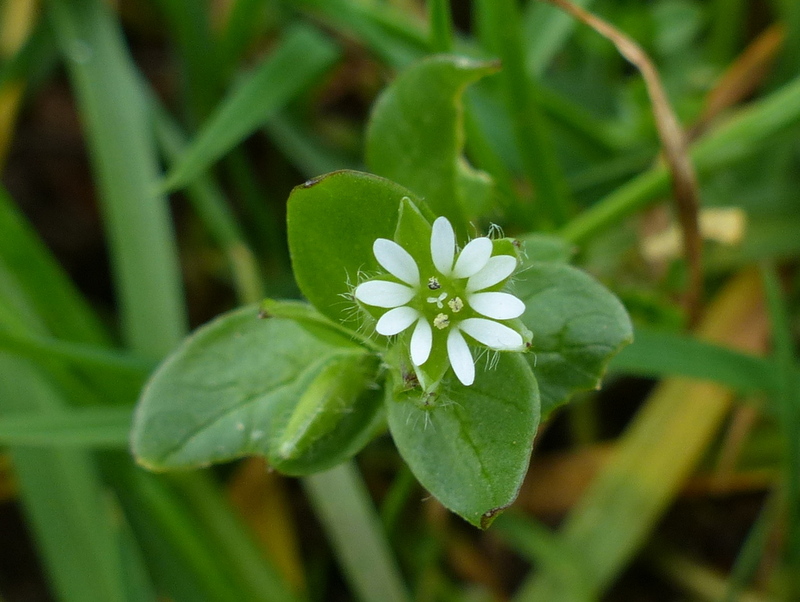 We have wild chickweed all over the garden. I will have to try it next summer. Love the butterflies, but it seems so early. It is a wonder you know where to look. I like Fizz’s happy look – quite becoming. How do she and the sheep get along? 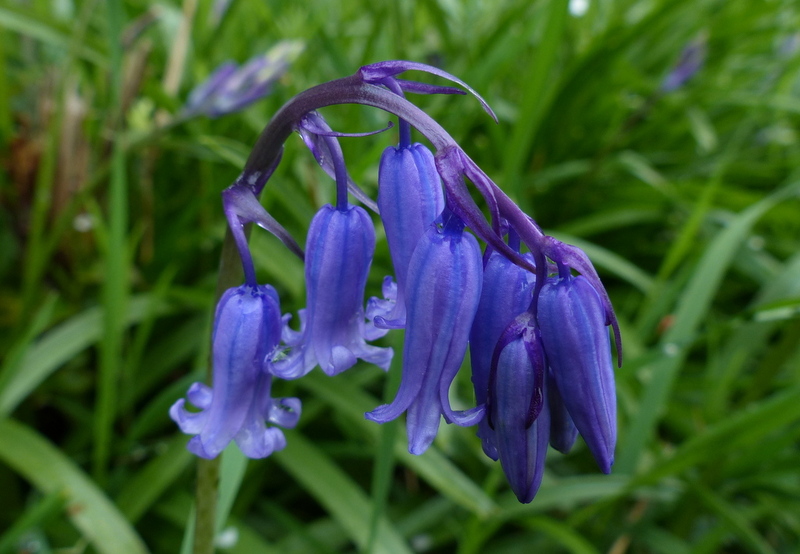 Thank you Eliza 🙂 I do remember where I saw my first flowers last year and the best places to look for Butterflies but then I have a photographic record if I forget. I think I’m going to write a story with the main character name of Harry Biittercress. He’s only happy when eating salad. Colin, if ever there was a place for cross-pollination, your blog is it. Love definitely blooms there! Lady Smock has always been attracted to Harry even though he’s beneath her. 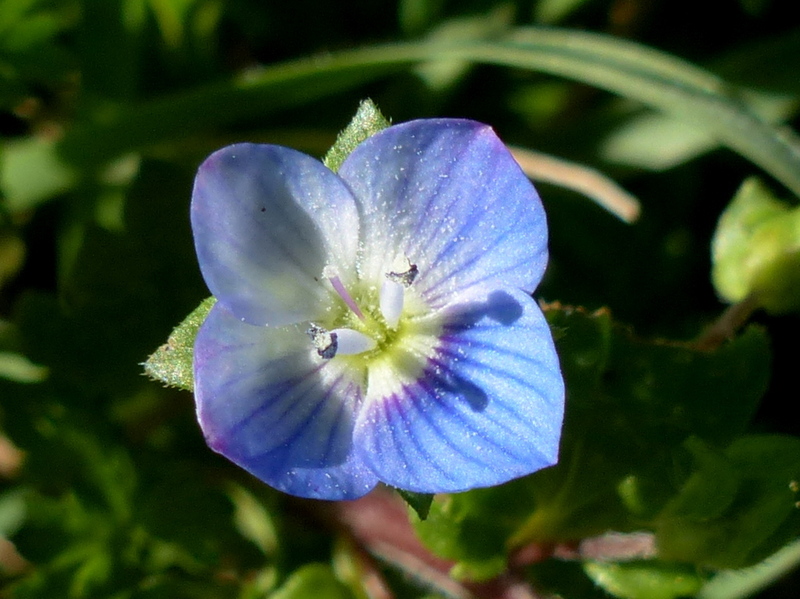 She’ll find out if he’s got the stamina and he’ll learn if she’s the pistil he’s always dreamed about. Thank you Stephanie 🙂 It is so nice to have interesting things to see when we go out. I am really looking forward to all of the creepy crawlies. Another lovely post. Few real signs of spring up north ,although some of the Polar Bears have started going round in pairs. 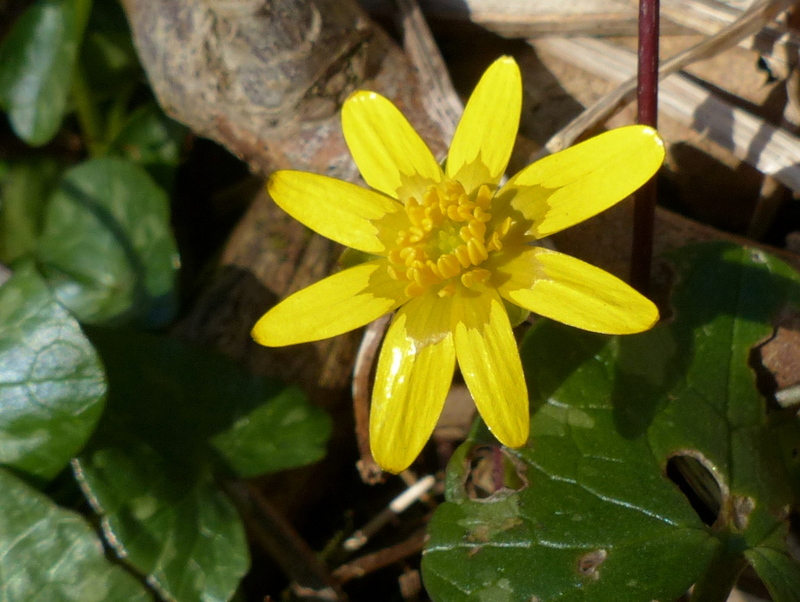 The leaves on the Lesser Celandine are nice, also. 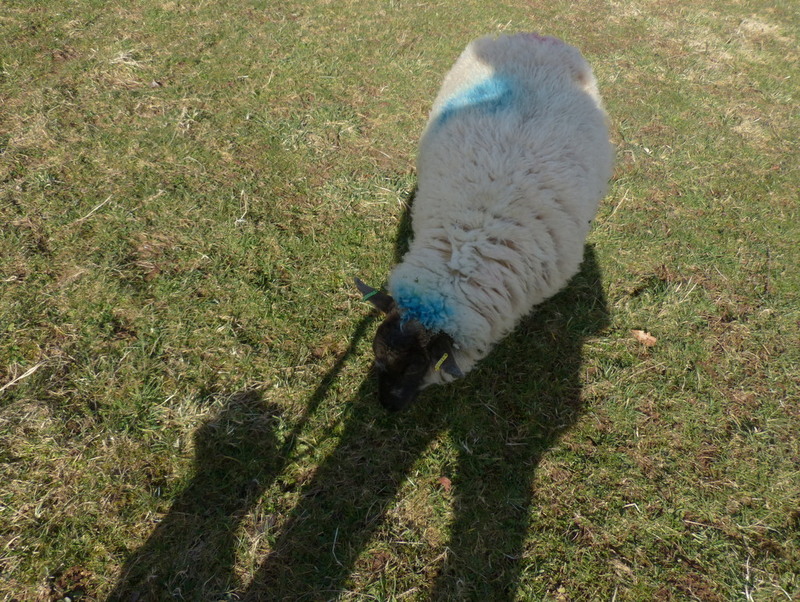 I agree that the shadows seem to be shrinking, or is it trick photography? 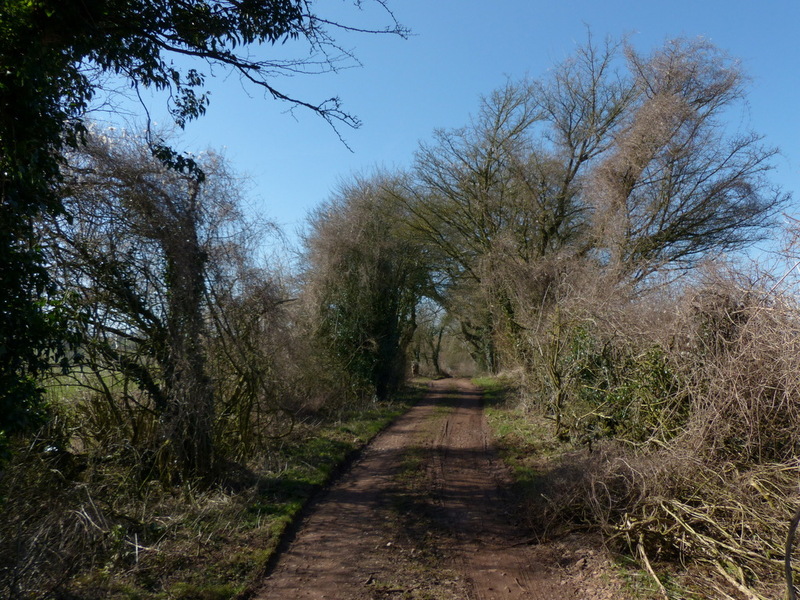 What a lovely time I had here today…must thank our mutual buddy, Elizabeth for sharing you with us! 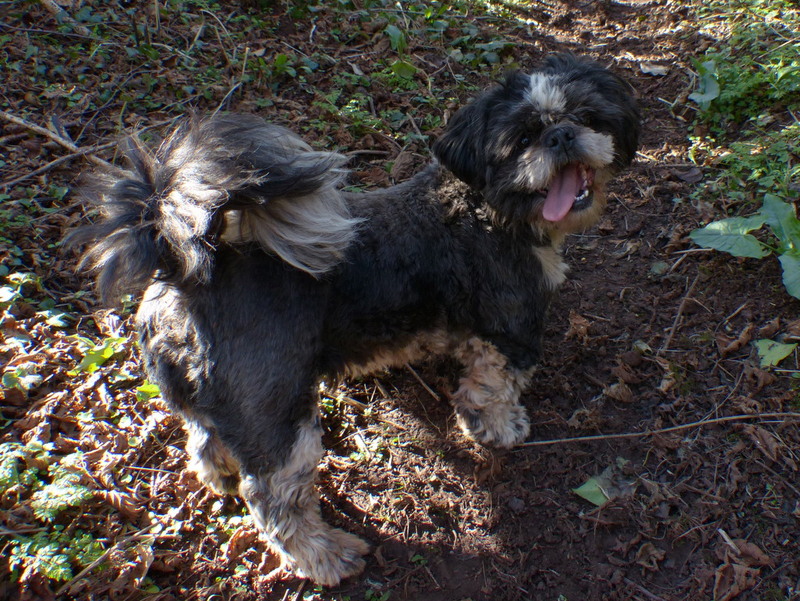 Fizz is just so cute!! Thank you Deb 🙂 It must be nice to live by the seaside. I do know some Australians who moan about the weather 🙂 but I guess that being by the sea takes the edge of the hot summer. It is nice to meet you. Thank you Gin 🙂 The sheep really liked having their pictures taken. We had been sent out on the hill to see if we could get them to follow us into the yard but in the end only six would come all the way with us. One gets the feeling that you will soon be dancing! 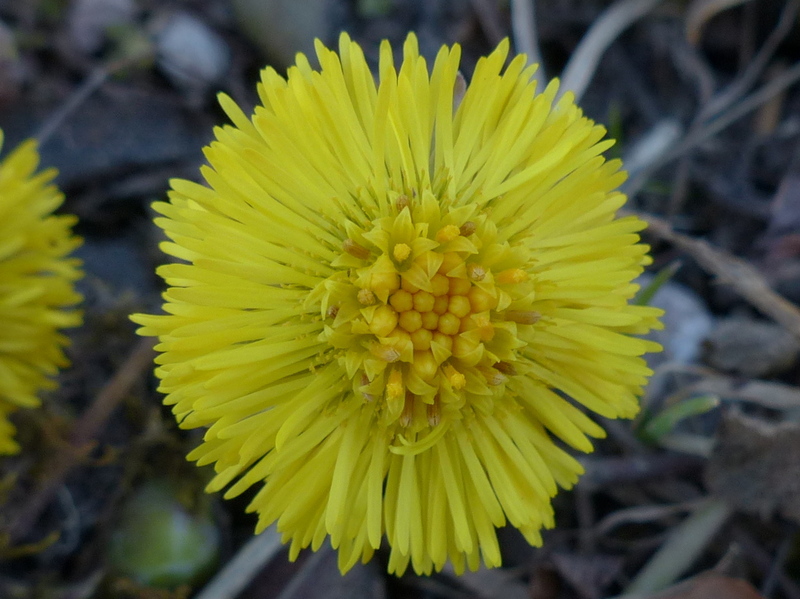 I feel the spring happy. Thank you Elen 🙂 Me too. Happy happy happy 😀 I am loving it.